Classroom copies of The Hive Detectives: Chronicle of a Honey Bee Catastrophe by Loree Griffin Burns. To identify the features of a modern honeybee colony and explore potential causes and impact of colony collapse disorder (CCD) through the work of bee scientists. This lesson uses the book The Hive Detectives: Chronicle of a Honey Bee Catastrophe by Loree Griffin Burns. The book was one of the winners of the 2011 AAAS/Subaru SB&F Prize for Excellence in Science Books. SB&F, Science Books & Films, is a project of the American Association for the Advancement of Science. In her book, Loree Griffin Burns presents an exploration of honeybees and the critical role they play in crop pollination and, ultimately, our diet. The book is organized into two parts: 1) Understanding healthy functioning of beehives, and 2) The work of bee specialists, wranglers, and inspectors in exploring Colony Collapse Disorder (CCD). The book features clear descriptions, easy-to-read language, vibrant photos, a reference section, and a glossary. A unique aspect of this book is that it situates the exploration of honeybees through people who are passionate and committed to working with them. This is particularly important since modern beekeeping centers on human management of healthy honeybee colonies. By focusing on people and the tools they use to work and study honeybees, the book also has the potential to expand students’ understanding of who does science and who science is for (e.g., local beekeepers). Additionally, the book and this lesson place students at the cutting edge of research and investigation, given that the cause(s) for CCD is still unknown. This lesson introduces students to modern beehives and then places students in an investigative role to understand CCD. Prior to the lesson, it may be useful for students to explore flower structure. Since some of the CCD research also mentions bacterial and viral pathogens, it may also help for students to have studied the differences between bacteria and viruses. Before beginning the lesson, it is important to contextualize honeybees in the larger context of pollinators and bee species. In terms of pollinators, honeybees are just one species of many vertebrates and invertebrates who pollinate plants, including 85% of the world’s flowering plants and more than two-thirds of the world’s crop species. Therefore, it is helpful for students to understand the importance of all pollinators, such as insects, birds, and bats, for global health and economic security. A common misconception is that all bees produce honey and live in hives. The reality is that only 10% of the world’s 20,000 known species of bees are social, living in and constructing hives. In North America, which has about 4,000 known species of native bees, only the honeybee (an introduced European species) and the native bumblebee live in colonies. Most bees are solitary and live in individual nests tunneled into the soil. An excellent student-friendly resource about native bees in North America is Bee Basics, produced by the USDA Forest Service and Pollinator Partnership. Finally, CCD only appears to affect managed honeybee colonies. We do know, however, that populations of native bees are also in decline. (For more information, you can read the Hundreds of North American bee species face extinction: study article from Reuters. The Xerces Society updates a Red List of North American native bee species and their conservation status. If a population in a food web is disturbed, there will be little or no effect on populations that are not within the linear sequence in the food web. If a size of a population in a food web is altered, all other populations in the web will be altered in the same way. This Discussion and Activity Guide for Burns’ book provides reflection questions and extension activities to support student understanding of honeybees, modern beekeeping, and CCD. Science Magazine hosted ScienceLIVE: Honey Bees in Trouble, an online science chat in 2013 on honeybees and colony collapse. It can provide you with background to support the lesson, including data. The video features one of the bee scientists in Burns’ book, Maryann Frazier. Consider inviting or visiting a local beekeeper to reinforce the book’s beginning profile on Mary Duane, a hobbyist beekeeper. In the assessment section, students will put their knowledge to practice by developing an action plan for planting bee-friendly wildflowers. Students can utilize the Planting a Bee-Friendly Garden student sheet to conduct their research and determine costs. Ideally, students will have an opportunity to follow through with their action plan, raise the funds, and purchase their needed supplies with the goal of planting wildflowers. For this reason, it may be best to plan this lesson so that students are able to plant in the spring. Directions for planting wildflowers, including video resources, can be found at How to Create Your Own Wildflower Meadow. Germination can be 4-6 weeks after planting. This is also a good time to invite a local community or Master Gardener to the classroom. Begin the lesson by asking students to think about an apple. If one can be brought to class, hold it up to show to students. Or you can show an image of an apple. Tell students that Americans eat more apples than any other whole fruit. Ask students, "How does an apple tree in one of America’s orchards produce the fruit?" 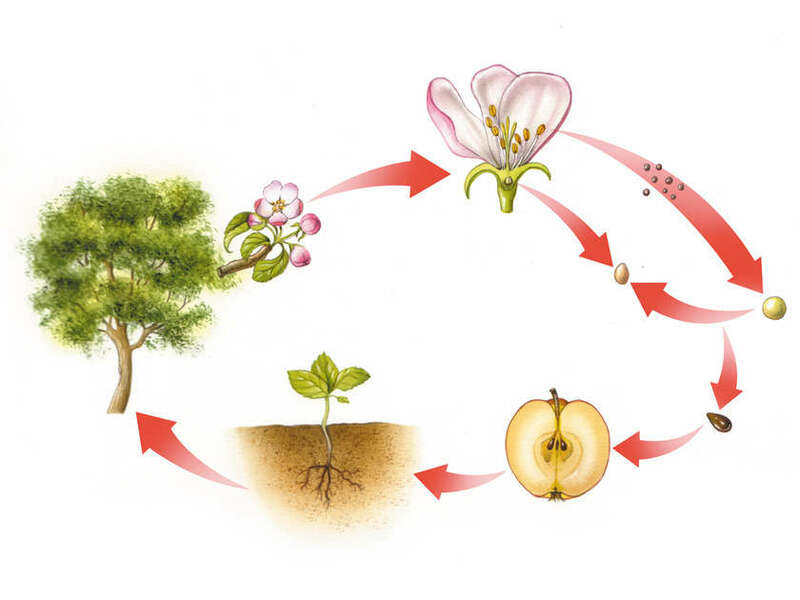 Write down key phrases as students answer, such as “flowers” and “pollination.” An image of the apple tree lifecycle can be shown to support student conversation. You can show them this image of an unlabeled lifecycle. For students who have already studied flower structure, you can show them this more detailed labeled image. Neither of the images depict pollinators; ask students to identify potential pollinators of apple trees. Tell students that the key pollinator for apple trees is the honeybee, so our access to apples in the marketplace is dependent on honeybee pollination. Ask students, "What are other foods in our diet that are pollinated by bees?" Show students this infographic detailing the different crops that are dependent on bee pollination. While many of these crops are part of the human diet, some of them are also important in raising animals, such as alfalfa hay and seed, which is fed to livestock such as cows. Now ask students, "What if we no longer had honeybees to pollinate these plants?" There would still be food available, but the variety of food would significantly decrease. In turn, this food shortage would cause prices of other food to skyrocket and would lead to inequity in food distribution globally. Show students this infographic about the economic impact of honeybee extinction. Focus on the bottom section entitled "Why it Matters: Bee Pollination Dependent Crops." Walk students through the major agricultural crops in the pie chart and highlight what percentage of the crop is pollinated by honeybees. For example, almonds are 100% pollinated by honeybees. Point out that these honeybee pollinated agricultural crops are worth $15-20 billion annually. End this section by reading the quote from Dr. Bernard Vallat, former Director General of the World Organization for Animal Health: "Bees contribute to global food security, and their extinction would represent a terrible biological disaster." This section is divided into two parts. In the first part of the lesson, students will use the book to understand the components and terminology related to a healthy, managed, moveable beehive. In the second part, students will take on an investigative role to understand possible causes of CCD, using the scientist profiles described in the book. Ask students what a typical managed beehive looks like and how beekeepers inspect their hives to ensure they are healthy. Students may bring up the use of protective covering, which is usually white because honeybees are not drawn to the color. Using the Understanding Honey Bee Hives student sheet, students should read pages 1–9 to walk through the components and inspection of a beehive, following the steps of hobbyist beekeeper Mary Duane. After they read the pages, show students this image of a typical movable hive. Compare the image to the structure of a wild honeybee hive on page 3. After the reading, ask students the following reflection questions. Students can also work in small groups to gather and share their reflections. What surprised you the most to learn through the reading? Describe one misconception that you had about honeybees and/or their hives and how that has been informed and corrected by the reading. As an optional follow-up to the reading, students can use their Hive Detectives student esheet to watch Beekeeping Honey Bee Hive Inspection of a hive inspection. Although the video is 25 minutes long, it provides a useful introduction to beehives, reinforces the terminology of the book, and also helps students appreciate how long it takes to inspect a hive. In the reading, three types of adult honeybees are mentioned: Drone, Worker, and Queen. Students should read pages 32–33, 40–41, and Appendix Bee on pages 56–59 of the book to complete the related questions on the student sheet. See the Types of Honeybees in a Hive teacher sheet for a completed table outlining the features of each of these adult honeybee types. One of the primary uses of modern beekeeping is the production of honey. Students should read pages 26–27 and 49–55 to explore the extraction of honey. Then, students should use their esheet to go to and watch How to Extract Honey from a Honeycomb, a video that demonstrates the process. Students should answer the following questions on their student sheet, based on their reading and the video. By the end, students should understand that honey is flower nectar that has been gathered by worker bees, stored in a honeycomb, concentrated by the process of evaporation, and used as food storage. What is the difference between pollen and nectar? Who carries pollen and nectar to the hive? Where is nectar stored in the honeybee carrying it to the hive? Once it arrives in the hive, where does the nectar go? At what percentage of water content is the nectar considered ripe honey by the bees? At this point, students should now have a good overview of modern beehives and beekeeping. A visit by a local beekeeper or to a local apiary can further reinforce student understanding of the concepts and terminology introduced in the Griffin’s book. In 2006, how many of Dave’s bees vanished? What are the characteristics of an abandoned beehive? Briefly describe the work of your bee scientist and their specialization. Describe the methods used by your bee scientist to study bees. Through their research, what have they discovered and learned about CCD bees? What are some things that are still unknown or unclear to them, based on their research? Since this book was published, new ideas and theories explaining CCD have been presented. Do an online search to discover what has changed. What should hive detectives and bee scientists do next? What are some of the interacting challenges impacting honeybees today? What are two things that each of us can do now to help honey bees? Now that students have learned about the importance of honeybees and the devastating impact of colony collapse disorder, they should work on an action plan to bring pollinator-friendly plants to their school garden. If your school does not have a garden, students can work on a window box or container that can be placed outside; emphasize to students that the actual plot of land needed to attract pollinators such as bees does not need to be big. This is why we can all make a difference in improving conditions for bees! The square footage of the area in which they will be proposing their planting. How Much Seed Do I Need? provides a reference for how to estimate this square footage. The type of flower coverage they would like: lush stand, average display, or scattered. The kind of wildflower seed mixture they will plant. How much seed mixture they will need based on the square footage, the desired coverage, and the type of seed mixture. The cost for their seed mixture. An action plan for raising money to purchase the seed mixture. Students can use their Hive Detectives student esheet to use resources to help them develop their plan. They can record the results of their research and develop their action plan on their Planting a Bee-Friendly Garden student sheet. As directed on the esheet, students will mainly use American Meadows, a distributer of non-genetically modified wildflower seeds, to conduct their research and price the cost of a wildflower seed mix that is appropriate for their region. When students are determining costs, you may need to ask students to include additional expenses such as soil and a window box, as determined by your local stores. Once students are ready to develop their action plans for raising funds, encourage teams to use the opportunity to raise awareness about the importance of bees and planting bee-friendly wildflowers. You can extend on some of the ideas in this lesson by leading students through a lesson that uses another book by Loree Griffin Burns, Citizen Scientists: Be a Part of Scientific Discovery from Your Own Backyard. Your students can learn more about the author herself with the Science NetLinks' Spotlight on Science Writers: Loree Griffin Burns. An excellent documentary to show students about honeybees and the worldwide honeybee crisis is More Than Honey. The documentary features incredible footage of bees and close-ups of honeybee behavior. A description and review of the documentary can be found here. Please note that in order to see the full documentary, you will have to pay a fee to access it. Students can research and identify native plants that support honey bees and other pollinators. Pollinator-Friendly Plants provides lists of recommended native plants. Students can create their own flower seed balls, which protect seeds from being eaten while they slowly germinate. A desription of how to make seed balls at low cost can be found at DIY Seed Bombs. The instructions also provide context about how some Native American tribes utilized seed balls to protect corn kernels from birds. Once seed balls are made, students can distribute to friends, family, or sell as part of their action plan. This Discussion and Activity Guide for Burns’ book provides extension activities to support student understanding of honeybees, modern beekeeping, and CCD.